The focus of the Rhine gardens along the regional garden route is not confined to the garden complexes but also covers the cultural landscape surrounding them as well as buildings such as palaces, castles, manor houses etc. The gardens presented do not adopt an isolated position which directs the visitor’s view exclusively towards the garden complex and its design. Rather, the buildings and the surrounding cultural landscape are also included in the overall concept. Landscape architects of previous centuries already regarded the ensemble of garden, landscape and buildings as a whole within which each of these individual elements was allotted a particular significance from different perspectives. While each of these elements is an individual work of art, it becomes clear that it is the garden which takes on a central role for their contemplation as an intermediary between the various levels in much the same way as a stage set. Eye-catching in their own right, the gardens simultaneously offer inward views towards the buildings and outward views towards the town and landscape. The concept of designing buildings, gardens and surroundings as an ensemble with lines of sight still serves as a model for the planning of contemporary complexes today. Town planning, garden design, private owners, investors, environmental protection and the preservation of historical monuments – it is only through awareness of the interrelations between these and the interplay of all those involved that our cultural garden heritage can be preserved. Captivating, beautiful and interesting gardens await the visitor. They could not differ more. 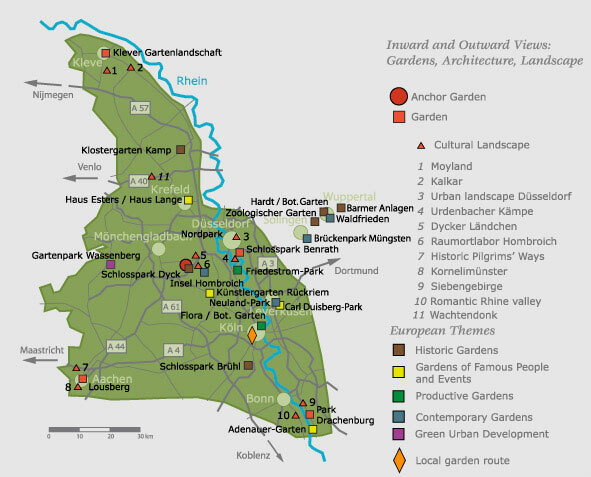 Palace gardens and town parks, domestic gardens and villa gardens and even a Landesgartenschau (Regional Garden Exhibition) appear in all their different facets in the cultural landscape of the Rhine. They all stimulate the visitor to undertake a journey of discovery and to experience truly personal inward and outward views. This route is being created around the anchor garden Schlosspark Dyck in Jüchen, Rhein-Kreis Neuss.